Thank you for painting the most beautiful portrait of my baby girl. You so captured her spirit - and I can't thank you enough. Everyone who has seen the painting has asked for your website, so I sent it along. I know that words are inadequate to describe the pain of losing our dearest pets. They give us their unconditional love and companionship and ask for very little in return. 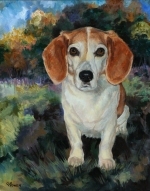 About one/third of my portrait commissions are for those pets who have "crossed the Rainbow Bridge," sometimes many years prior to my starting the pet portrait. Since I work from photos, it is not necessary for the pet to still be with us to create their painting. 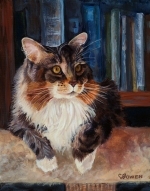 When I am working on a pet portrait for an animal who has passed, I feel it is a special privilege to connect with the energy of the animal's spirit. A pet painting is a way to honor the life well-lived of a true angel. 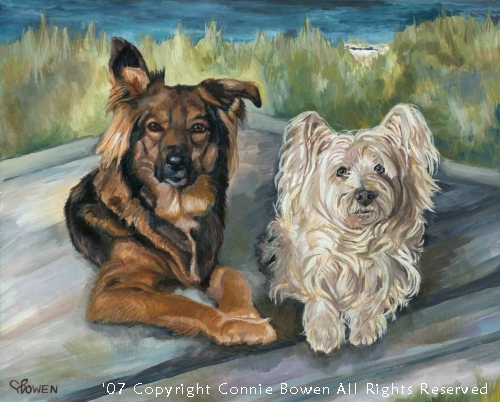 The portraits below were commissioned as gifts for family members who were grieving the loss of their beloved pets. In some cases, I have included the e-mails I received. 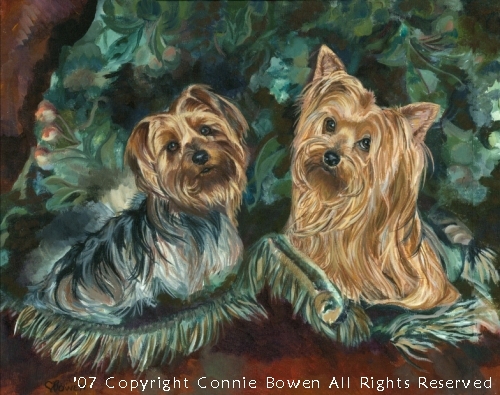 Benji and Bo were beautiful Yorkshire terriers. Benji had crossed about ten years prior to Bo crossing. They did live together for a short while. 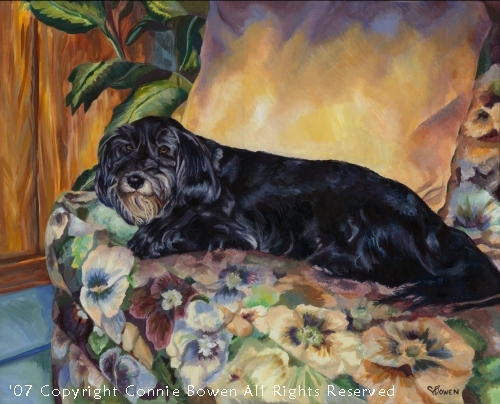 In the reference photo for this painting, Benji was actually on top of a sofa with his guardian's hand by his muzzle. I simply "lifted" him up out of that photo and placed him next to Bo and "wrapped" the blanket that had been around Bo around Benji, too. Now the two are depicted together in their portrait, just like they are I'm sure together in their new life in the world of spirit. I wanted to let you know how much I love the portrait of Cindy. It is so beautiful and very special to me. Yesterday, as I was sitting and looking at it, I let my eyes go out of focus for a moment and it was just like she was sitting there with us. It is very comforting at this sad time. Thank you for putting so much love into this. I love it! "I am THRILLED with the portrait. On Mothers Day we had many family members over. The portrait was the topic of conversation. My 29 year old son......who was Bogart's best pal, was left speechless when he first saw it. He also said it was like they were back with us. That is truly how I feel. I'm not embarrassed to admit that I talk to them in the painting, and on occasion I touch the painting, ever so softly as to not damage it. I cannot thank you enough. 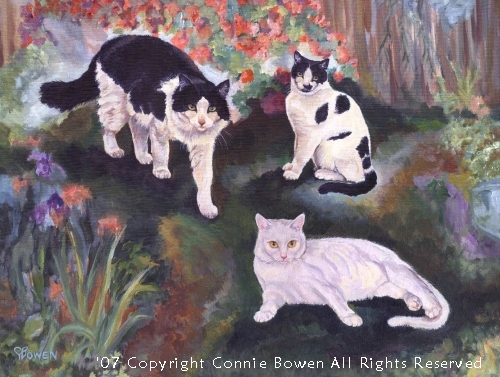 Bogart, Dottie and Lilly's painting was created using two separate photos and placing all the cats in their garden. Dawn wanted a lot of contrast around each cat so that her three beloved family members would stand out - just like they did when they were alive. "This was the family gift to Ed, and yes to myself. We had it at my son's house and he wrapped it so Ed had to peel each layer of Tissue back in order to get to the painting. First time I saw Ed with tears after he got a gift. I wish the real beauty would show up, Connie did a wonderful job. She took this from three photos, this was Ed most loved picture of Misty when she was very young. The picture of Tasha was the last photo of her before we knew she was so ill, again the one that showed up how her eyes turned light when she was trying to tell me something. This will hang in the bedroom where Ed can say Goodnight to Misty and I can say Goodnight **** ****." Eve explained to me how much Misty and Tasha loved the beach, so we decided on a beach background for the dogs' portraits. Tasha, the Westie, is actually sitting on a couch in the reference photo. It was a true delight to work on Ms. Squiggs' 24x30 painting. In the reference photo, the pillow behind her was a grey/beige color. I wanted to bring the colors of the couch she was laying on into the pillow, and I also wanted to surround her with a beautiful golden light. When Denis and Vicki saw their painting for the first time, their descriptive word was "Breathtaking!" "Hi Connie: It's really beautiful and I know David will love it. I would like you to soften out the left side of her where there is kind of a grey edge and just blend it more so it looks a little more feathery like her other side. Other than that it's beautiful and ready to go. It's such a special gift and will mean so much to him. Clea's portrait above explains the process I use a little bit. After the painting is finished, I send a .jpg of the painting to each client for approval. At that time I am able to make minor changes such as this one for Clea's fur. 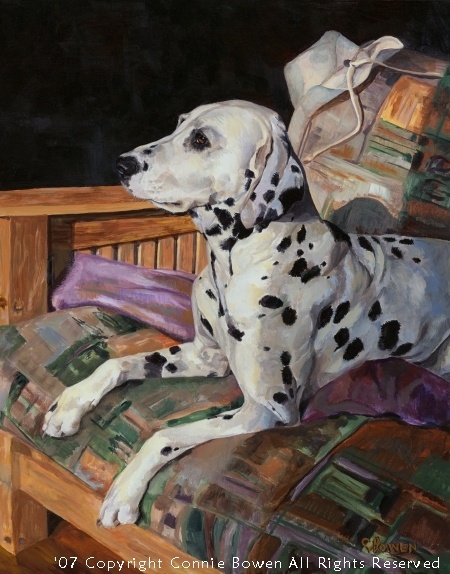 So every pet portrait is picture perfect when it is picked up or delivered/shipped. Karen's eyes filled with tears when she picked up her portrait of her most-cherished Clea!